The 38th (Welsh) Division’s first major action during the war was at Mametz Wood on 7th July 1916. Located to the north-east of the village, this wood was strongly held by the Germans and blocked all Allied progress to the north-east. The attack began with an artillery bombardment, which was meant to be followed by the laying down of a smoke screen to mask the troops’ advance. The wind made this impossible, meaning the soldiers had to advance across 300-400 yards of open ground in full view of the Germans. The attack continued throughout the day with further bombardments and infantry advances, but eventually all survivors had to be redrawn. A further full frontal attack was launched on the 10th and after two days of bitter fighting and at a cost of 4,000 casualties, the Welshmen managed to clear the wood. 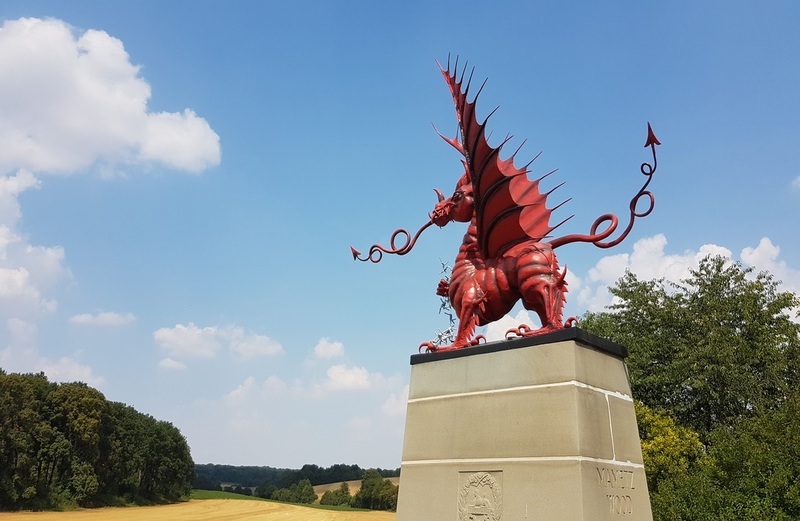 A red dragon, clasping barbed wire in its claws, designed and forged by David Peterson of Carmarthen, was unveiled close to Mametz Wood in 1987.